For those who believe prayer doesn't work, I offer the following as proof of divine intervention: The Phantom of the Opera is shutting down. 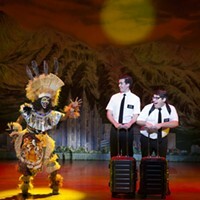 According to the powers-that-be, the show is making its farewell tour of the provinces (landing here in Pittsburgh thanks to the Cultural Trust and Broadway Over America). And once it's over ... it's over! But if we've learned nothing else from the Phantom himself, it's that dead doesn't necessarily mean dead. The Broadway production, which opened in 1988, is still running (and there was that 2004 movie version which, for some reason, nobody seems to remember). But the truly unsettling news is this: Tricksy composer Andrew Lloyd Webber has a sequel in store! That's right: It's called Love Never Dies, and it's already opened in London, where critics immediately dubbed it Paint Never Dries. My favorite review called it "a waste of perfectly good dry ice" -- which is still nicer than the reviews Phantom received when it opened. Phantom was at the forefront of the "popera" movement of musical theater, and Webber was one of the driving forces behind that pretty much defunct theatrical style. (Think Les Miz, Miss Saigon and anything by Frank Wildhorn.) These were huge musicals about absolutely nothing, with a contemporary score of non-stop singing. Turning to the traveling production, I should mention that my date for the evening called the show "entertaining." But he is from West Virginia, so take from that what you will. On the upside, I enthusiastically salute the technical and design elements, which fall under the purview of Peter von Mayrhauser and the late Maria Bjornson. It's thanks to them that the evening turns out to be not quite the complete loss I had feared. Bored with Webber's embarrassingly juvenile score? I suggest contemplating the intricate care with which the bejeweled bustles have been layered over the richly textured dresses. Do the simplistic characters, who rarely rise to the dramaturgical complexity of sock puppets, get you down? Forget your troubles by focusing on the 40-foot folds of fabric flowing down, up and across the stage ... this show is all about drapes. And it has a top-flight cast, including Tim Martin Gleason and Trista Moldovan as the Phantom and Christine, with Sean MacLaughlin and Nancy Hess playing Raoul and Madame Giry. Kim Stengle, D.C. Anderson, Michael McCoy and Luke Grooms provide comedic support; their talent is sufficient to distract you for a few moments -- or at least it would be if the cast wasn't contractually obligated to sing Webber's melodies and Charles Hart's lyrics. So it's goodbye to Phantom of the Opera ... don't let the door hit you on the way out. The Phantom of the Opera continues through Sept. 19. Benedum Center, 803 Liberty Ave., Downtown. 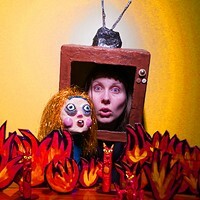 412-456-6666 or www.pgharts.org.